File contains the set designs for Neptune Theatre's production of "Absurd Person Singular," directed by L. Yeo with designs by Fallen. The play opened on November 13, 1981. 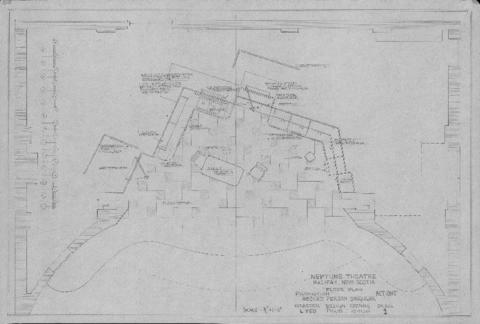 File includes the original pencil-drawn set designs and annotated copies. See the production records for this play in the Neptune Theatre fonds (MS-3-1): Box 134, Folder 10 (correspondence and notes); Box 41, Folder 30 (play script); Box 130, Folder 24 (house manager's reports); Box 258, Folder 21 (house manager's reports); and Box 67, Folder 20 (correspondence and contracts regarding royalties).